For centuries, Morocco has been at the crossroads of trade, seeing caravans of salt and gold destined for Europe cross the Sahara, while the East and Europe brought spices and finished goods, respectively. Coupled with geographic diversity and a temperate climate that allows for a year-long growing season, it’s no surprise this stunning country developed a strong culinary tradition. Moroccan food is often mischaracterized as spicy. It’s not, but the use of many different spices contribute to the “spiced” foods the country is known for. The tasty mixture of sweet and savory is also very common, with combinations like beef and prunes or chicken and raisins served regularly. 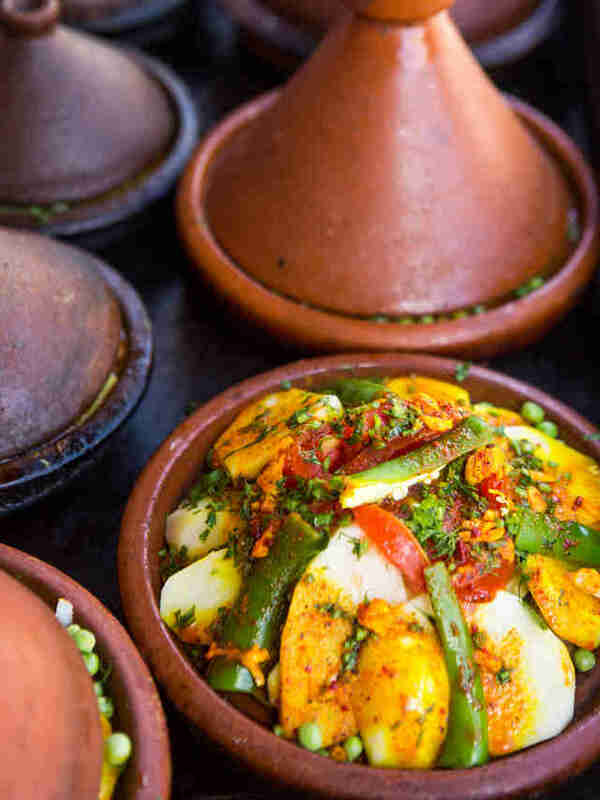 A common thread that runs through the Moroccan kitchen is the use of one name to describe multiple dishes -- you might see tajine listed as a dish, but there are dozens of varieties of tajines. (All worth trying!) 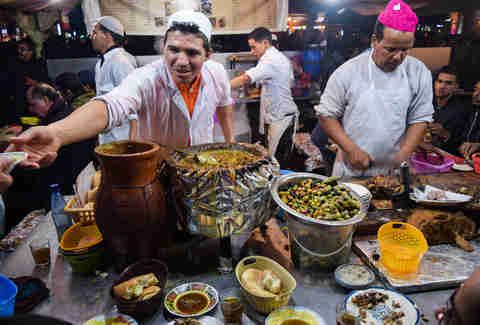 Additionally, the concept of nose-to-tail dining is a way of life in Morocco. All parts of an animal are used or eaten, like sheep brain cooked in tomato sauce or grilled liver skewers, a treat and often eaten at holidays like Eid al Adha. While different regions have their specialities -- seafood in the coastal cities, rustic breads and stews near the Atlas Mountains -- Morocco’s flavors run deep. What better way to get to know the country than through your palate? The food of royalty, bastilla is one of the stars of Moroccan cuisine. This traditional meat pie is usually reserved for special occasions like weddings or impressing special guests. Due to its high cost, it was once only enjoyed within the royal household or upper class homes -- rumor has it this dish was created in the royal kitchens of Moorish Spain and found its way to Morocco after the Inquisition. In the 20th century, however, ordinary Moroccans got a taste for its sweet-and-savory flavors. Chicken (or more traditionally, pigeon) is cooked with onions and spices until so tender it falls apart. The chicken is removed, while eggs are slowly added to create a silky broth. Warka or warqa, the Moroccan version of phyllo dough, is laid out and the chicken mixture, the egg mixture, powdered sugar, and crushed almonds are layered and wrapped up to create a round pie. The whole shebang is baked and topped with more cinnamon and powdered sugar. Bastilla (also called pastilla) can also be made in a seafood version though the ingredients vary drastically. Fez lays claim as the home of this dish -- if you find yourself here, trying bastilla is a must. This riad was formerly a pasha’s palace built in 1372 and has been painstakingly restored since 2012. The on-premise restaurant specializes in bastilla -- make your reservation early to enjoy this dish with some mint tea. Patisserie Bennis is one of Casablanca’s best places to pick up pastries, especially bastilla. Originally hailing from Fez, the family set up shop in Casablanca’s Habous neighborhood. 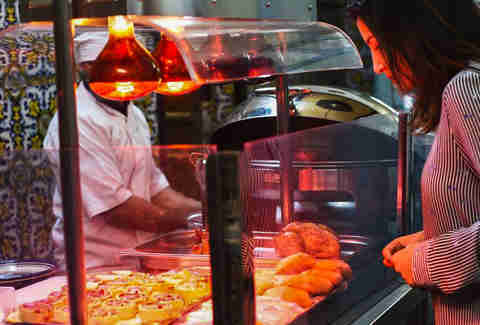 This patisserie offers both chicken and seafood bastillas, as well as a large range of other Moroccan savory and sweet offerings. 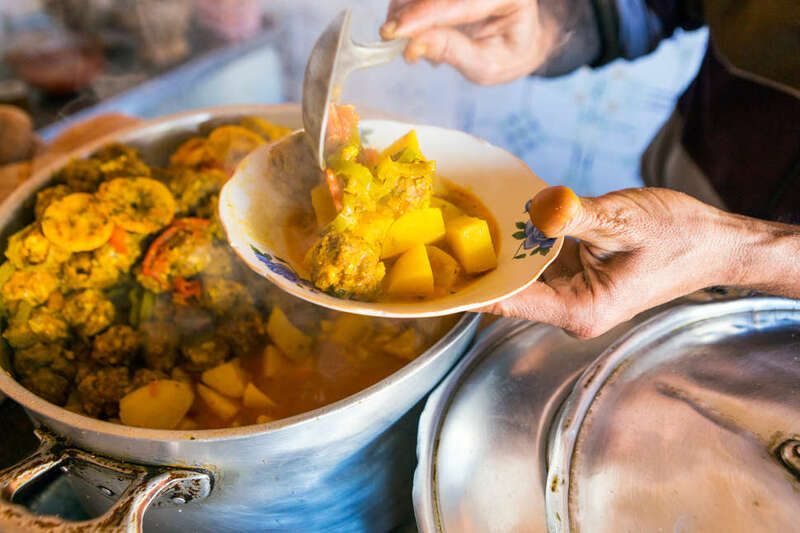 The city of Taroudant, southwest of Marrakech, is definitely under-the-radar, but this charming mud-walled market town attracts hikers of the Atlas Mountains and Berber traders with its delicious food offerings. Riad Maryam features a verdant patio teeming with local citrus and flowers. Known for traditional tajines and pigeon-filled bastilla, the restaurant’s biggest star is the bastilla au lait. This dessert version features fried layers of warka dough, sandwiching cream, crushed almonds and powdered sugar. Reservations recommended. Couscous may be the one Moroccan food the world is most familiar with, thanks to the instant variety you’ll find in your grocery store. Real Moroccan couscous takes several hours to cook. In a Moroccan home, Fridays are dedicated to making couscous. The centerpiece of the dish is semolina: grains steamed until light and fluffy, topped with flavorful broth, vegetables and meat. 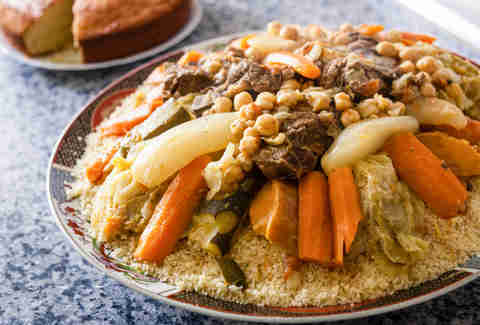 In a colander-like vessel, the semolina is steamed above a pot of spice-laden broth, which also cooks the vegetables, lamb, or beef -- the most common couscous toppings. The finished couscous creates a nest for the veggies and meat, with extra broth drizzled along the top. Some restaurants may have couscous available every day, but don’t be surprised if you find it only available on Fridays. While you can dine in, this restored riad close to the old Badi Palace of Marrakech also gives you the chance to prepare couscous yourself. Daily private cooking classes teach you to make couscous from scratch, like couscous royale with lamb and merguez sausage, or couscous tfaya with lamb and caramelized onions and raisins. Dinner reservations are also available. Located in the beach town of Dakhla, in the Moroccan-controlled Western Sahara, this little downtown restaurant is a beloved favorite with locals. With fantastic food and affordable prices, expect specials every day -- Fridays are, of course, reserved for couscous. Expect the most traditional preparation, with lamb and seasonal vegetables. While Tunisia is really known for its fish couscous, you do still find the dish in some areas of Morocco, especially the north. At Riad el Reducto, you’ll find a slightly different style as Tetouan was the capital of the Spanish protectorate of Morocco -- the riad itself once housed a noble family from Seville and in 1948, became the residence for a Moroccan grand vizier. 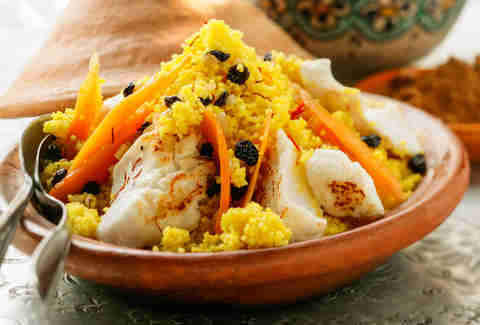 The restaurant’s dishes reflect the riad’s history, including the generously portioned fish couscous. Tajine (or tagine) describes both the traditional conical clay dish used in Moroccan cooking, as well as the contents cooked within. The centerpiece of everyday dining, there are dozens of different preparations that vary by season and by region. The ingredients are generally simple: Seasonal vegetables or fruit, some type of meat if available, spices, and a long, slow cooking time. Today, instead of traditional charcoal cooking techniques, many people have taken to pressure cookers to speed up the cooking time. You may be treated to meat-heavy dishes when visiting restaurants, but in home cooking, meat is a smaller portion -- the remainder of the dish is made up of vegetables and mrqa, the thick broth that forms when the tajine is cooked down. Tajines are meant to be shared and eaten with bread, not a fork and knife. They’re also not eaten with couscous on the side. Couscous and tajine are two separate dishes. Because of the seasonal nature of cooking in Morocco, you’ll find that menus change regularly. There are also many tajines that rarely find their way to restaurant menus and are reserved for the home. To try some of these, it’s best to stay in a riad and ask the host if they can prepare one for you. Some of these specialty tajines include rabbit tajine, goat meat with dried prunes or apricots, eel with raisins and onions, or djej m’hammer, chicken with spices roasted directly under the oven heat to create a crispy exterior. At this mountain lodge just under two hours from Marrakech, you’ll find Berber tajine, a lamb or beef version slow cooked over charcoal and dotted with vegetables and olives. The meat emerges pull-apart tender, and served with local tafarnout bread, a rustic flatbread used to mop up the deeply flavored sauce. You can always expect fresh, seasonal flavors at this highly-regarded but tiny restaurant in the striking, blue-walled city of Chefchaouen. Beldi Bab Ssour is known for its homey, family-style dishes -- go with the tajine of that day is and you won’t be disappointed. On the rue Tangier in this port city off the Atlantic, you’ll find this unassuming spot serving amazing tajines. Choose from what they’ve made for the day or you can order whatever you’d like -- be prepared to wait a few hours. Seems silly to wait, though, when the classic chicken, preserved lemon and olive tajine is almost always available, though you can also opt for a fish tajine with the catch of the day. An entire cookbook could be written just on Morocco’s breads -- it’s the single food that crosses every socioeconomic and geographic line in the country. Bread is a revered part of Moroccan culture, so much so it’s never cut with a knife or thrown away. Rarely is a meal eaten without it present. It acts not only as a part of the meal but as the utensil -- it’s what is used to scoop up tajines and mop up sauces. The standard Moroccan loaf is round, denser than pita bread but not nearly as puffy as a standard loaf of bread elsewhere. Bread is everywhere, but be on the lookout for these varieties. These are all names used for the same basic bread. When known as msemmen, it’s folded into flaky square layers. As malawi, it’s the same recipe but wrapped and cooked in a circle instead. They are common in the northern cities of Meknes and Fez. Harsha is a flatbread made with course semolina that resembles cornbread in texture. It’s best eaten warm and topped with melted butter and honey. In the Saharan regions of Morocco, the Berber stuffed pizza was born. In Arabic it’s called medfouna (meaning buried) a play on the way it was traditionally cooked: buried in a sand oven, the dough stuffed with ground meat, lamb or beef, herbs and spices. It’s flattened and cooked through. 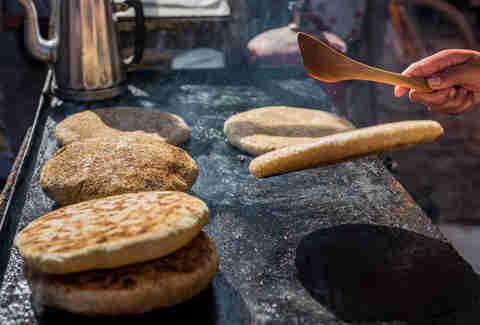 This Amazigh (Berber) bread -- very similar to Indian tandoor breads -- is cooked in an open fire one at a time, and in some areas the bread is slapped against the inside of a clay oven. In other places, it’s laid on top of a bed of rocks to cook, and still in other areas, you’ll see it made on a metal tray inside the fireplace and quickly spun until it’s completely cooked. My sons’ school teacher told them the story that the reason this bread (which resembles a less-dense baguette) is called comer is because of how it was distributed. Under the French protectorate, Moroccans would line up in bread lines to buy their bread. The French would tell them “comme mur,” meaning stand like a wall or line up. This word was then used as the word for that type of bread. Whether that’s the real meaning or not we’ll never know, the comer in Essaouira is the best. Moroccan food is almost always cooked by women -- except for tangia. One of the easiest Moroccan dish to make, its historically found in the souks of Marrakech, made at the hands of men. That’s why it’s sometimes called the bachelor’s dish. Not to be confused with tajine -- though both also lend their names to the earthenware cookery used to prepare the respective dishes -- one tangia tradition says men who worked together in the market would pool their resources on Thursday, so as to prepare tangia on Friday, their day off. One person would be in charge of preparing the ingredients: Cuts of mutton, preserved lemon, garlic, cumin, a dredge of olive oil and a pinch of saffron, sealed in the clay urn and sent to slow roast in the ovens of the furnaces that power Moroccan hammams (bathhouses). The next morning, the urn would be retrieved and the men would head to a garden outside the city to enjoy a picnic lunch and savor their day off. Off this unassuming strip just off the main Jemaa el Fnaa market square, you’ll find the historical heart of Marrakech tangia. Each of the three shops here is owned by a different family who have been operating for generations. Few people think of seafood when they think of Morocco -- but with over 1,200 miles of coastline, it shouldn’t be a surprise that seafood is plentiful and delicious. You can find both Atlantic and Mediterranean varieties on offer. Moroccans prepare fish and seafood a few ways but the most popular is grilled or fried. In coastal cities, there are dozens of grilling stands set up waiting to cook up whatever the fresh catch of the day is. For a more robust preparation, fish is coated in charmoula, a North African marinade of lemon juice, garlic, cilantro, paprika, cumin and salt. An unassuming but popular spot just off the steps that lead to the souk, you won’t get any choices here: Everyone is served the same 4 courses made with the catch of the day. The restaurant doesn’t take reservations and is only open for a few hours at lunch and dinner. You can’t avoid sardines in Essaouira, and the best way to try them is grilled. In the port, you can easily purchase sardines (and any other seafood that catches your eye) and then head to the grills set up nearby. For a small fee, someone will cook your meal, which you can enjoy at their open tables. Oysters are new to Moroccans, and many of the farms that grow them in Oualidia and Dahkla do so for export. Ostrea II is well-loved for their fresh oysters. If you’re iffy about buying them seaside or from a vendor, than head here where you can be certain they’ve been properly handled. It might sound strange that a restaurant so far inland (Fez is more than 200km from the nearest ocean or sea) would be a destination for seafood. But, chef Najat Kaanache constructs her seasonal menus around seafood and 100% local ingredients. With a background cooking in some of the finest restaurants in the world, Kaanache takes Moroccan seafood to an elevated level. Amanda Mouttaki is an American writer based in Marrakech with her Moroccan husband and children. She is the voice behind the popular website MarocMama and owns Marrakech Food Tours, showing English-speaking visitors the best hidden eating spots in Marrakech’s medina.